Have you ever tried making kimchi at home? 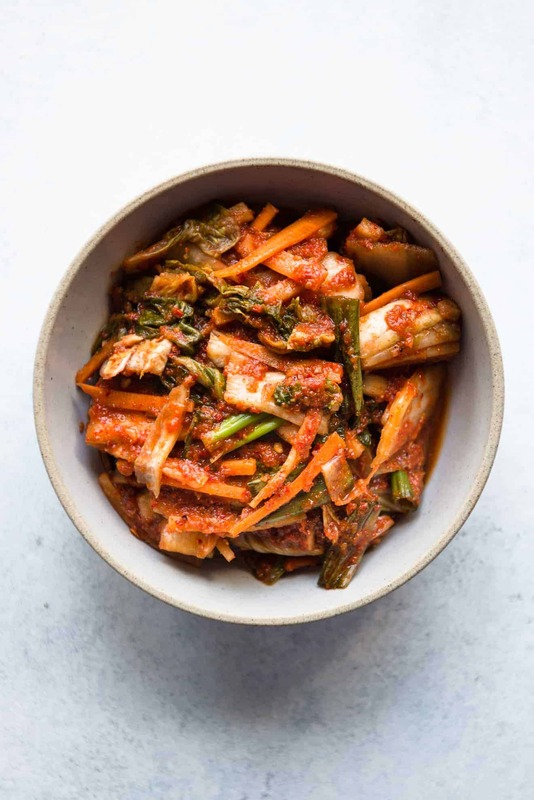 This vegan kimchi is a great place to start. It’s mildly spicy with a hint of sweetness and all the pungent flavors of kimchi! See video below for the step-by-step cooking process. When I posted this picture of a test batch of vegan kimchi a few months ago, a lot of people asked me what made my test batch vegan. Isn’t kimchi just fermented vegetables? It dawned on me that not everyone knows that many varieties of kimchi are seasoned with seafood (fish sauce, salted shrimp, etc.). Heck, I sure didn’t know about it until I started making my own last year. Let me first back up and say that there are many, many varieties of kimchi and not all of them use seafood or meat stock for flavoring. But a vast majority of them do, especially the familiar baechu kimchi that we see in Korean restaurants. 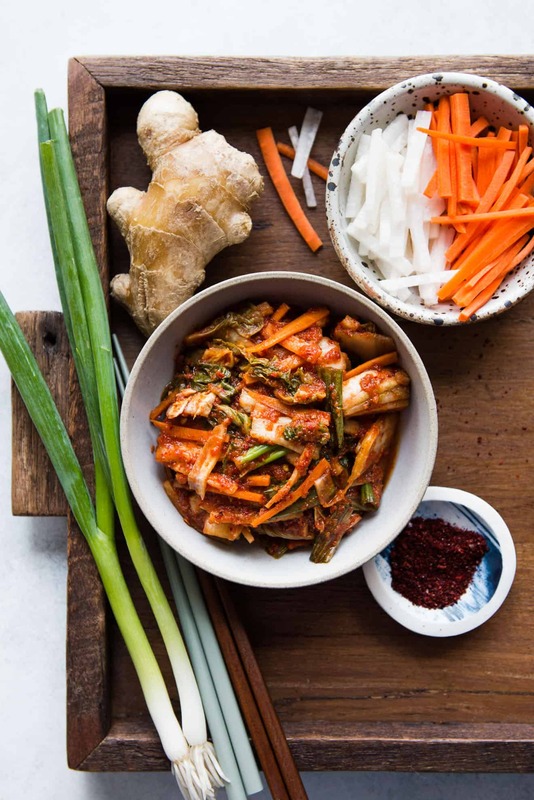 The process of making kimchi is not as intimidating as it may seem, though it does require time and patience—at least a week. By the end of week, however, you’ll be rewarded with a batch of tasty, pungent kimchi! There are essentially 4 phases to making kimchi: brining, seasoning, fermentation, and storing. For many kimchi recipes, you’ll need to brine a head of napa cabbage in salt water overnight. Brining is important for breaking down the cabbage, allowing it to absorb the seasonings that you’ll add in the next phase. It also helps develop deeper flavor for the kimchi. The next phase is seasoning the vegetables. The seasoning for baechu kimchi is usually made with a starter rice flour paste that is blended with Korean chili pepper flakes (gochugaru) and other spices. After mixing the vegetables with the seasoning, we move on to the fermentation phase. Because the vegetables contain naturally occurring yeast, you don’t need to add bacterial cultures to ferment the vegetables. Store the vegetables away from sunlight at room temperature in tightly sealed jars. I like using wide-mouth canning jars like this one and this one, but wide-mouth mason jars work, too. Ideally, the room temperature should be somewhere around the 60s and low 70s fahrenheit during the initial fermentation. If the temperature is any warmer, just pop the jar into your fridge. The colder temperatures mean a longer initial fermentation period (around a week instead of 3 to 4 days at room temperature). As the vegetables ferment, do not be tempted to open the jar. When you open the jar, you expose the vegetables to oxygen, which disrupts the fermentation process and can cause mold. You may also notice juice building up inside the jar and bubbling within the liquid. That’s perfectly normal. It’s an indication that lactic acid is active, and the vegetables are fermenting properly. 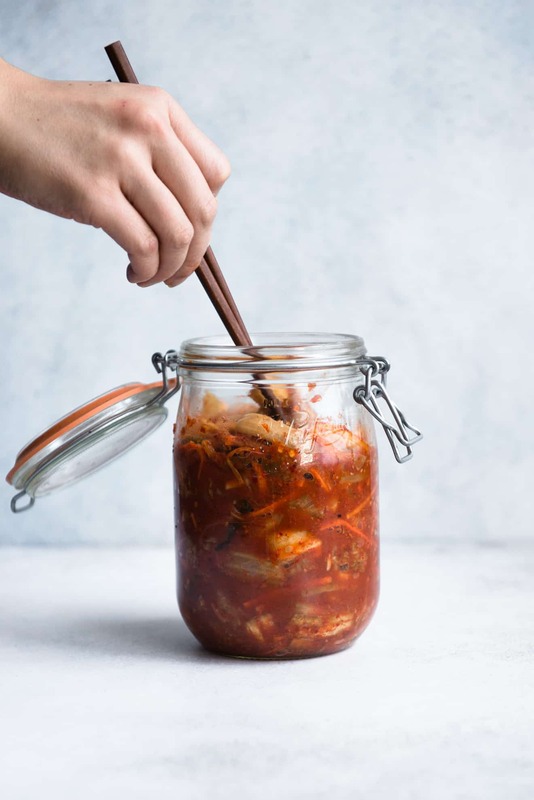 Once you have fermented the kimchi at room temperature for a few days, you’ll transfer it to the refrigerator for final fermentation and storage. I usually let the kimchi sit in the refrigerator for another 3 or 4 days before tasting it. Again, I know this seems like a long process, but the actual steps aren’t too complicated. After making my own kimchi, I don’t think I can go back to store-bought ones anymore! The recipe requires making a paste from glutinous rice flour. You can find glutinous rice flour easily in Asian supermarkets. Bob’s Red Mill’s sweet rice flour works, too. However, we’ll only use 1 tablespoon of the flour, so I don’t blame you if you don’t buy a bag of rice flour for a limited purpose. Cornstarch should also work. Instead of using fish sauce and salted shrimp for the seasoning paste, I’m using soy sauce and ground porcini mushrooms for this vegan kimchi. I usually buy a small package of dried porcini mushrooms and grind it with a coffee grinder dedicated for my spices. The reason why I made a small batch kimchi recipe is because my husband doesn’t enjoy eating kimchi as much as I do, and it’s difficult for me to eat a huge batch by myself! This vegan kimchi recipe yields just under a liter of kimchi. I used an Asian pear in this recipe because I like how sweet and juicy they are, and they help make a nice seasoning paste. If Asian pears are not readily available, feel free to use a sweet apple, such as fuji apples. Rinse the napa cabbage thoroughly and remove any discolored leaves. Slice the napa cabbage into 2 halves, and slice each portion in half again, so you have 4 quarters. In a large bowl, stir the kosher salt with 8 cups of water, until the salt dissolves. Carefully place the cabbage into the brine. If it doesn’t look like there is enough water to fully submerge the cabbage, top off the bowl with more water. Place a plate over the cabbage to keep the vegetables submerged under water. Cover the bowl and let it sit at room temperature overnight. Drain and rinse the cabbage. Take each section of the cabbage and slice it in half to get 2 long strips. Slice the strips into 1 1/2 to 2-inch pieces. Mix the rice flour with 2/3 cup of water in a saucepan. Bring the water to boil over medium heat. Stir the mixture constantly to break up the clumps of rice flour. The mixture should start to thicken in 1 to 2 minutes. Let the mixture simmer for 1 minute and turn off the heat. You should have a thick mixture that looks like pudding. Transfer the mixture to a bowl and stick it into the fridge to cool. Once the rice mixture has cooled to about room temperature, transfer it to a food processor. Add the gochugaru, garlic, ginger, light green and white portions of the scallions, asian pear, salt, soy sauce, and porcini mushroom powder. Blend everything until you get a smooth mix, scraping down the sides of the bowl, if necessary. Transfer the napa cabbage pieces to a large bowl. Add the carrots, daikon, and dark green parts of the scallions. Stir to combine the vegetables. Pour the seasoning mixture over the vegetables. Wearing gloves, thoroughly rub the seasoning into the vegetables. You want to wear gloves because seasoning stains and the spice from the peppers can be too much for your hands. If you don’t have gloves, you can also stick your hands into plastic produce bags. 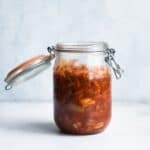 Carefully transfer the kimchi to a sterilized canning or mason jar. Pack the kimchi and seal the jar. Let it sit at room temperature in a cool, dark place for 3 to 4 days. DO NOT open the jar during this initial fermentation period. This will expose the kimchi to oxygen and can lead to mold. 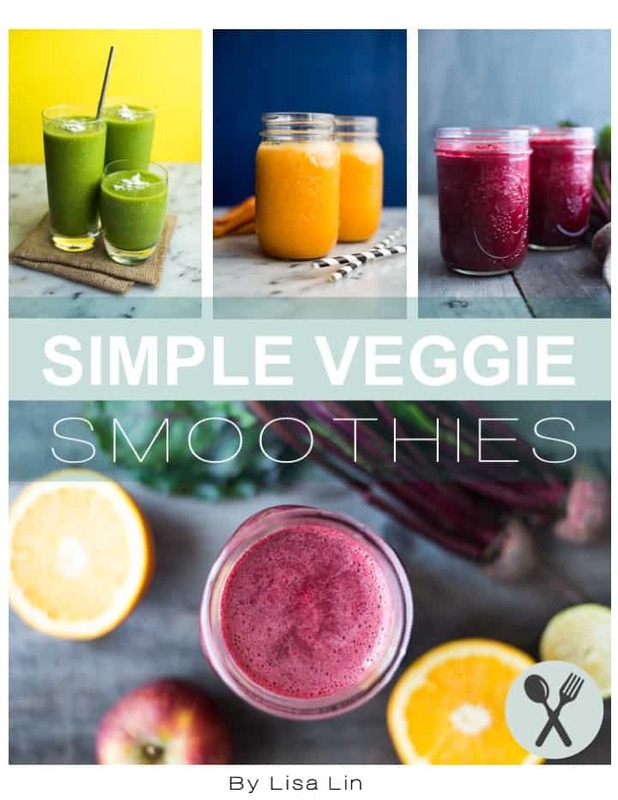 If you notice juice and bubbles forming in the vegetables, don’t worry. That’s exactly what you want to see. Transfer the jar to the back of your fridge and let it sit there for another 3 to 4 days. Taste the kimchi. If you prefer more sour kimchi, leave it in the fridge for a few more days. The kimchi will continue to ferment over time. Otherwise, serve it with your favorite foods! I sterilize my jars by running very hot water inside the jars and letting them air dry before canning. 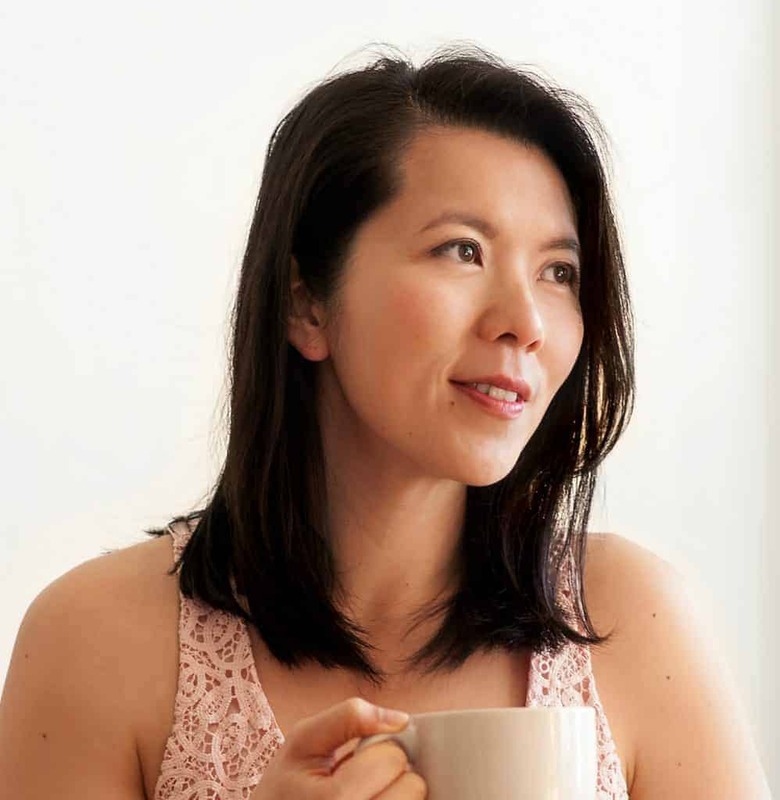 Question: I have regular rice flour – do you think that will work? maybe I can do 1 part flour one part cornstarch (or vital wheat gluten to replace the lack of gluten in regular rice flour)? I just don’t want to buy a whole bag of glutenous rice flour. I am very excited about this recipe! I love kimchi but I’m a vegetarian and all the recipes out there are for a HUGE batch. can’t wait to make it! Hi, Sarah! I think regular rice flour should work! Let me know if it does! I would love to use your feedback to update the recipe notes.